I don't really car for Primus much anymore (even though I saw them live six or seven years ago), but I've always liked this little group of cover songs. "Making Plans for Nigel" is the standout, but their version of the Meters' "Tippi Toes" is fun, and "Have a Cigar" is good, too. I used to put "Tippi Toes" on every mixtape I made for a while. 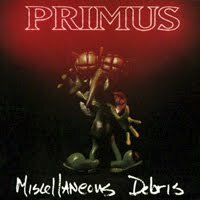 Yeah, I never fully gave myself to Primus either. I wanted to but they just never really grabbed a hold of me. It was probably the jam aspect? Lord knows I hate jamming.